Since Thanksgiving is coming up soon, I wanted to kick off the recipes this week with one of the best parts of a holiday meal – dessert. Pie is ok, but I’m more of a cake person. So, every Thanksgiving we have both pie and cake. 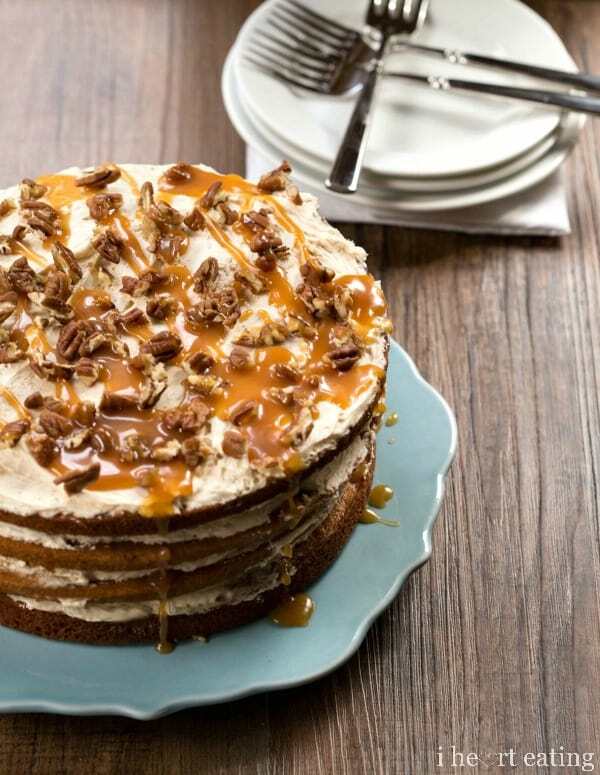 When the cake is for a special dinner, not just any ol’ ordinary cake will do. This Browned Butter Pumpkin Spice Cake with Salted Caramel Buttercream Frosting is anything but ordinary. 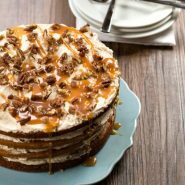 This cake has four layers of moist, pumpkin spice cake, and four layers of sweet and salty caramel buttercream. All of that is topped off some crunchy chopped pecans and a drizzle of salted caramel sauce. This cake also works really well as a make-ahead dessert. Just let the layers come to room temperature, slice in half (if baking in 2 pans), and wrap well in plastic wrap. The layers can be frozen for a few days before use. When you’re ready to frost the cake, simply unwrap, frost, and then let the cake sit until you’re ready to serve. Preheat oven to 350 F. Grease and flour (or use a nonstick spray with flour) to grease 2 (or 4) 9-inch round cake pans. In a small saucepan, melt the butter over medium-low heat. Cook, whisking occasionally, until the butter turns a golden-brown and begins to smell nutty, about 4 minutes. Set aside. In a large bowl, mix pumpkin puree, granulated sugar, and brown sugar until combined. Stir in eggs, vanilla, milk, and Greek yogurt until well-combined. Add browned butter, and stir until just combined. Bake for about 25-30 minutes for two pans and about 15-20 minutes for 4 pans. Cake is done when a toothpick inserted in the center comes out clean. Remove cake to wire rack to finish cooling. Once the layers have reached room temperature, they can be wrapped in plastic wrap and frozen for later use. I made this for Friendsgiving yesterday and everyone loved it. I have a solid group of greedy friends, so they know what they’re talking about. It was pretty epic. I’m very excited to try this recipe. I am allergic to wheat and am going to try your recipe with cloud 9’s cup-for-cup gluten free mix. I’m hoping it turns out. I would be curious to know how a gluten free version would turn out as well!